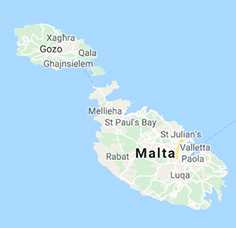 Newark School Malta is a school providing early years education, primary and secondary schooling mainly for international children. The classes are small thus providing quality education. It is located in Sliema which is a residential area and much sought after by the foreign workers working in Malta. The school has experience in Erasmus +. It is presently participating in 6 Erasmus + projects. There are 30 teachers working in the school on a full time basis and one head of school. Education in Malta is obligatory for children between 4 and 16 years of age and the school is regulated and licenced by the relevant education directorate within the Ministry of Education and Employment. The teaching is done in English. Inclusion and diversity are part of the school ethos and children with special needs are integrated within a normal class. Children with special needs have a learning support assistant to guide them. San Andrea School is situated in the heart of the Maltese countryside at L-Imselliet (between Mosta and Mgarr). This is an ideal location which is easily accessible while providing a safe and healthy environment for the children. The school consists of three purpose built buildings - Early School, Middle School and Senior School - with an area providing sports facilities, as well as a Multipurpose Hall for theatrical events and sporting activities. During their time in the Early School the children are not merely getting a glimpse of learning, but vital foundations for life-long learning are being laid. Learning at this stage has to be highly experiential, so 'doing' allows for more learning to take place. Within our school, emphasis is placed on creative and self-directed learning and on the development of various personal and social skills. Our aim is to ensure that their love of learning is nurtured so that the children achieve their full potential. Middle School serves the needs of children between the ages of 7 and 11 before they enter Senior School for the final phase of their compulsory education. Here, the children are prepared for the different subjects that they will take up at Senior School level. They are given subject teachers for certain areas so that they will start to learn to adapt to different subject areas, and to different individual teachers. The Senior School is built around a number of departments, namely the Sciences (Physics, Chemistry and Biology) and Mathematics, Humanities (History, Geography, Environmental Studies, Religious Studies, Accounts, Economics, PSHE), Languages (Maltese, English, Italian and French), ICT and Technology, Practical Subjects (Physical Education, Drama, Art & Home Economics). These departments serve the need of students between the ages of 11 and 16. Newark Kindergarten and Nursery is an exclusive preschool and childcare founded in 2010. We are dedicated to treating our children as individuals to help prepare them for the new experiences ahead of them. It provides a smooth, sunny introduction to real school, setting the stage for further education. We provide opportunities to learn, practice social, emotional and problem-solving skills, development of esteem, co operation, pre-language and literacy skills and hands-on, hearts-on activities. This is done in a family-friendly environment which is also warm, safe, happy, stimulating and has a realistic adult/child ratio. Other services include open all day, all the year round for working parents, flexible hours and babysitting at night. Kindergarten is a time for sparking and directing children’s curiosity and natural love of learning whilst learning how to express themselves. We are confident that we will be able to prove to you why Newark is the right choice for you and your child, but don’t just take our word for it, arrange a visit to take a look around. Mission Statement, “To instil in children the love for life and the self-confidence to be always able to follow their life compass”. This year’s summer school programme will take children on a magical journey to amazing imaginary lands through activities such as Storytime, Sport, ICT, Water Games, Arts and Crafts, Taekwondo, Cookery, Music and Drama, Mindfulness, Gymnastics, Experiments, Swimming and weekly outings (for older groups). Our learning organisation sees summer as a great opportunity to take learning to a deeper level through innovative strategies. Our summer family is made up of trusted and specialised teachers and enthusiastic staff. The energy level and creativity ensure that children are kept interested, excited and engaged and changing weekly themes keep imaginations fired. Our Summer School is open to children between the ages of 2 ½ and 10 years. Children may join a two-day, three-day or five-day programme.